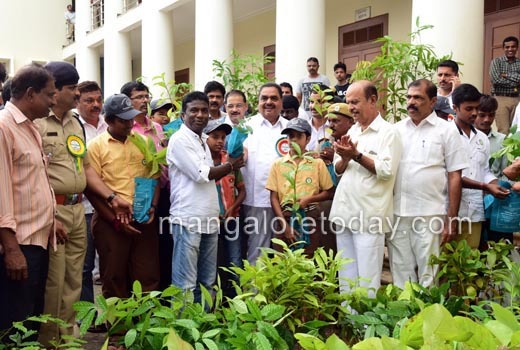 Mangaluru, July 10, 2016: DK District In-charge Minister and Minister for Forest, Ecology and Environment B Ramanath Rai said that each gram panchayat in a district can raise 2,000 to 5,000 saplings under the MGNREGS Mahatma Gandhi National Rural Employment Guarantee Scheme. A minimum of 25 lakh saplings will be raised in a district for planting by next fiscal, he pointed out. Speaking at the Vanamahotsava, Koti Vriksha Andolan programme and distribution of Aranya Mithra award, organised jointly by the Forest Department, district administration, Zilla Panchayat, Mangalore City Corporation, District Legal Services Authority and Karnataka State Pollution Control Board at the Town Hall on July 9,Saturday. The Minister stated, "I will urge the Ministry of Rural Development and Panchayat Raj to issue guidelines on saplings to all the zilla panchayats in the state. 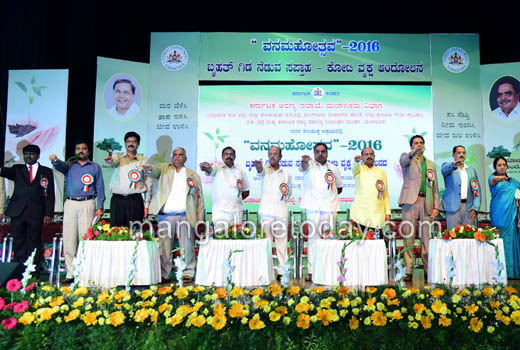 The government has plans to plant eight crore saplings in the state through the Koti Vriksha Andolan. The government has earmarked funds in its budges to hold the Koti Vriksha Andolan in the state. People should join hands with government departments to make the drive successful," Rai urged. The minister reminded that the existing laws and rules alone cannot conserve forests. The people should join hands with the Forest Department in conserving and increasing the green cover for the future generation. According to the data released by the Forest Research Centre (Dehradun), Karnataka has added 28,000 hectare to the forest land in the last few years through its afforestation drive. "Temperature in several districts of the state had crossed 40 degrees Celsius this year. We need to reverse this trend of rising temperature. All departments, public and private sector companies, public health centres, schools, institutions and NGOs should join hands to increase the green cover in the state," he added. 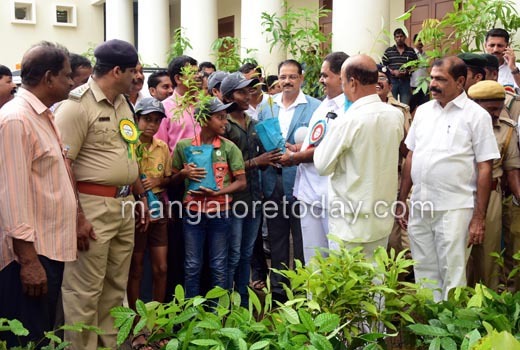 Mangaluru Circle CCF Sanjay Bijoor said that, under Koti Vriksha Andolan, 4.14 lakh saplings have already been planted in Dakshina Kannada district. "The Forest Department nurseries have developed two lakh saplings to be distributed among farmers, of which 60,000 saplings have already been distributed. 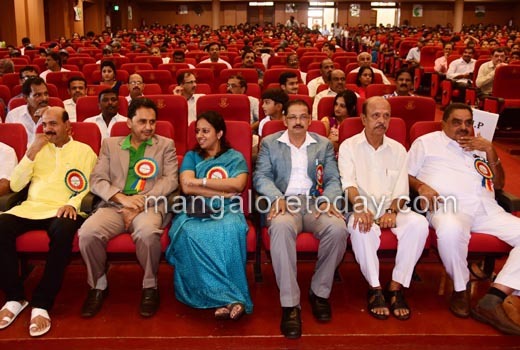 ’Bithotsava’ (sowing fest) will be taken up on the banks of rivers, and inside the forest to grow plants. 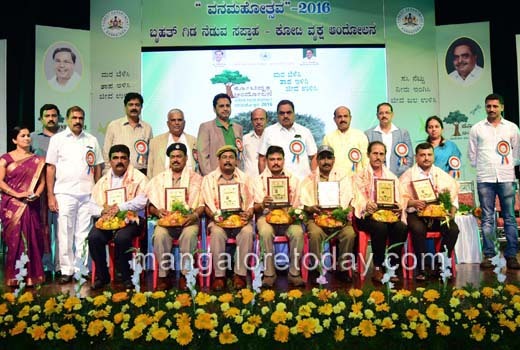 The Forest Department has taken up sandalwood conservation in an area of 43 hectares at Veerakamba in Bantwal taluk. Apart from this, medicinal garden are grown at Puttur along with Daiyi Vana at Karinjeshwara in remembrance of Deyi Baideti," he listed out. Corporates and industrialists have come forward to nurture at least 7,000 saplings during the year. Bijoor appealed to all schools, colleges and religious institutions to contact the office of RFO, for the saplings to be planted in their premises. Pointing out that trees are ’oxygen factories,’ the CCF said that a man requires at least 3 cylinders of oxygen per day. If the cost of one cylinder of oxygen is Rs 700, he will have to spend Rs 2,100 for oxygen in a day, he added. 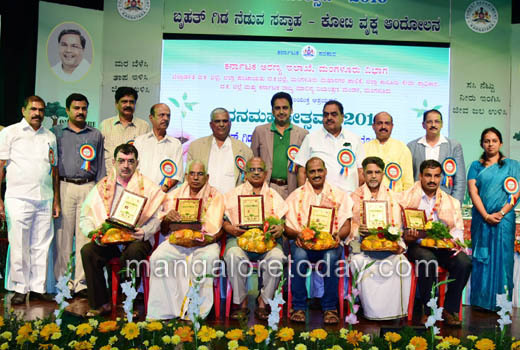 The Aranya Mithra Awards were conferred on A Krishna Bhat Bapla, Spandana Nagaraj, Lakshmisha Tholpadi, Chandrashekar Damle, Vidyasri Friends Charitable Trust and Grama Aranya Samithi, Mandekolu. An awareness jatha was carried out by students. The students of Canara College and members of Boyzone dance group staged cultural programmes. Members of Shivani Musicals sang environment-based songs.